In this gallery are to be found all pictues of Irish Railway infrastructure, both in the Republic and in Ulster - stations, signalboxes, etc. These pictures are published for pleasure/information/research purposes only and are not for sale or copy under any circumstances. Information in captions has been researched as thoroughly as possible but its accuracy cannot be guaranteed. 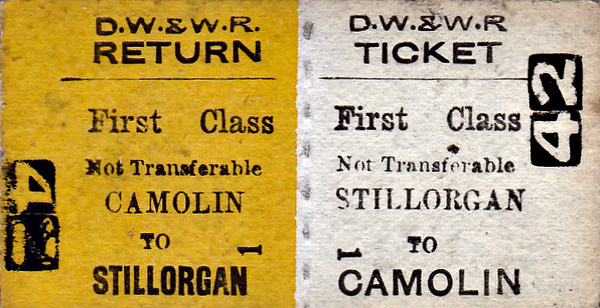 DUBLIN, WEXFORD & WATERFORD RAILWAY - STILLORGAN - First Class Return to Camolin.